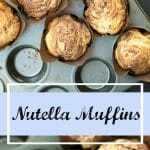 Deliciously moist Thermomix Nutella Muffins that are quick and easy to make and go perfectly with an afternoon cuppa. They taste delicious straight from the oven or can be popped in the freezer to enjoy for another day. 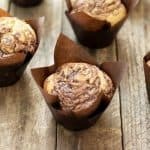 I’ve made these Thermomix muffins in celebration of World Nutella Day on Monday. If you’re a big Nutella fan then you’ll love these – they’re moist and fluffy on the inside with a crunchy Nutella topping. If you’re a Nutella lover then check out the recipe for Nutella Icecream, made with only 3 ingredients and ready to eat in a few minutes. 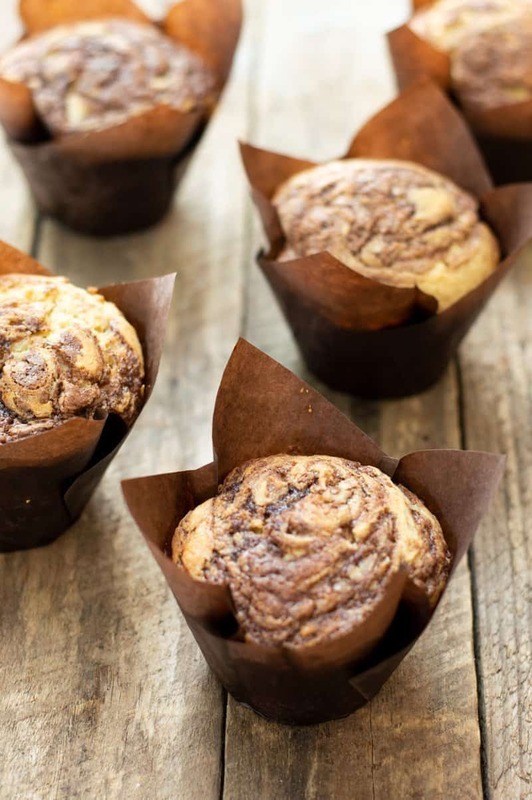 A delicious muffin base with a crunchy Nutella swirled topping. Preheat the oven to 180C / 160C fan forced and line a 12 hole tin with muffin cases. Melt the butter in the TM bowl for 40 sec/50/speed 4. (Omit this step if the butter is already at room temperature). Add all the other ingredients to the TM bowl and mix for 5 sec/speed 4. Scrape down the bowl and gently mix the rest with a spatula until fully combined. (try not to over mix otherwise the muffins will become dense). It doesn’t matter if the mixture is lumpy. Spoon the mixture into the muffin cases until 2 thirds of the way up. Blob some Nutella mixture on top of each muffin and gently swirl around with a toothpick. Bake in the oven for 20-25 minutes (depending on the size) until lightly golden. Eat warm straight from the oven and enjoy! The muffins taste best fresh from the oven but they can be stored in an airtight container for a few days or in the freezer for up to 3 months.